This is a place where The Buzz features things we make from the garden, or that we make in or for the garden, and things that you make in or from your garden. First off, as they’re seasonal – Olives. In my last house I’d planted an olive tree that had some bumper years. It was a Manzanilla, a fat Spanish olive that goes a dark, dark purple/black when ripe. 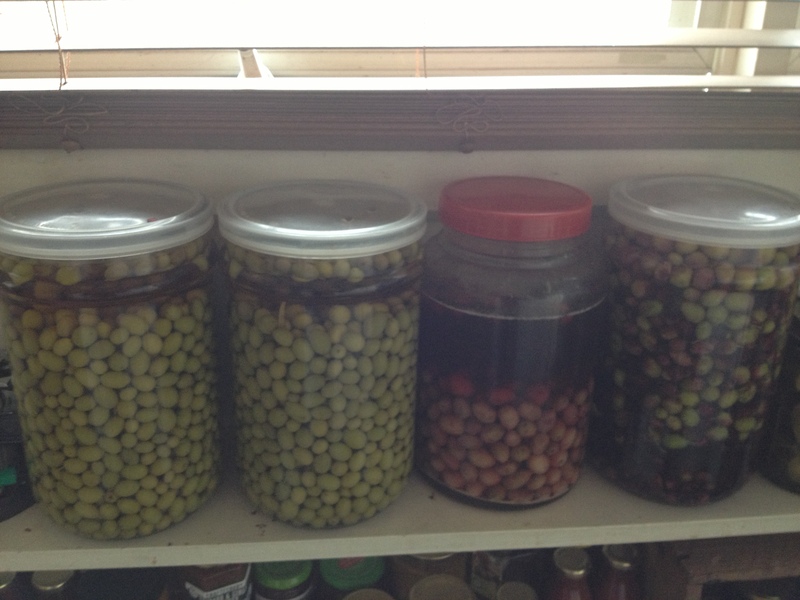 I had many years of joy (and some heartbreak) picking and pickling those olives. Originally, I followed a recipe from Burke’s Backyard magazine, as I always trusted Don and his before-his-time commitment to urban gardening. But the results were mixed: some years good, some not so good. A few years ago I went to the Glen Lyon Fine Food & Wine Fayre, and talked to the guy making and selling his Malmsbury Olives, which were olives from out of this world. When I recounted my mixed results with pickling, he gave me a photocopy of his method. Such an incredibly generous thing to do. He told me that the rinsing every day for 40 days method, which seemed to be what most people followed, was in fact wrong – it stripped the olives of all their natural sugars and reduced the development of good bacterias. His method is also much, much easier. Basically it’s 100g of salt to 900ml water (a brine), which you multiply according to how much you need, dissolve the salt in the water by heating, allow to cool, then pour over the olives in a large, sterile jar. Then leave them for a few months, testing after six weeks or so to see how they’re going. The longer in the brine, the better. When they’re ready, reduce the salt volume to about 6%. Since I began using this method I’ve not had a bad olive. The olive tree that was already here, at this house, is a different kettle of fish. The olives and the tree are much smaller than the Manzanilla and they don’t ripen in the same way. Hence, this year I decided to do a lot of green olives from the tree’s bumper crop. The olives in the jar with the red lid are from last year. The others are all from this year, in great jars ($14.95 each, with lids) and with sea salt from Costante Imports on Bell Street in Preston. When the sun comes out again, I’ll take a photo of the current olive tree, and what my plans are for it in the coming year. It still has a lot of olives on it, which may prevent a good crop next year. But, given we have enough olives here to last until the apocalypse, that might not be a bad thing.